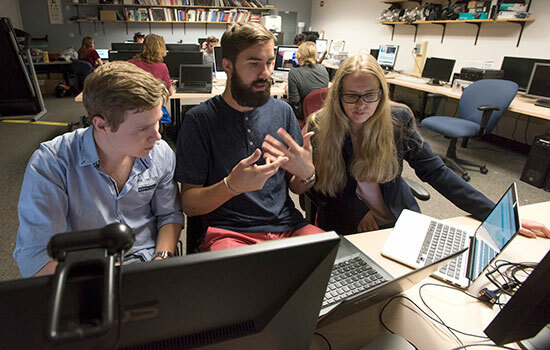 This summer, students from Malmo are conducting research along with students from across the United States enrolled in the Research Experience for Undergraduates Site in Computational Sensing. Rochester Institute of Technology expanded its partnership with Malmö University this summer by hosting Malmö undergraduate students for a 10-week intensive research experience. 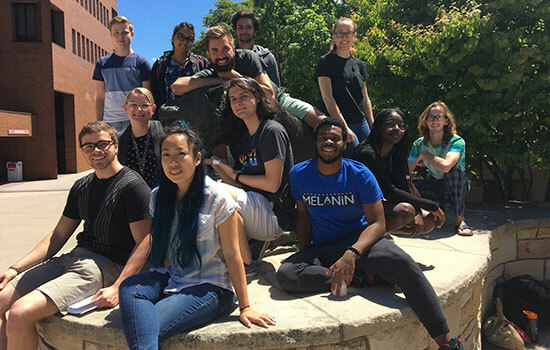 The Malmö students are conducting research in human-centered computational sensing alongside students from across the United States participating in the Research Experience for Undergraduates (REU) Site in Computational Sensing. While RIT and Malmö University’s students have participated in semester-long exchanges and their faculty and administrators have visited each other’s campuses multiple times, this marks the first time Malmö University students have engaged in research at RIT. Malmö University computer science majors Gustaf Bohlin and Kristoffer Linderman are developing a system that recommends videos based on how users physically react to other videos. They are conducting their research under the guidance of RIT associate professors Cecilia Ovesdotter Alm, from the College of Liberal Arts, and Reynold Bailey, from the Department of Computer Science at RIT. Bohlin and Linderman are working alongside 10 undergraduates enrolled in the REU who came to RIT this summer from universities including Georgia Institute of Technology, University of Puget Sound and University of Maryland, Baltimore County. The common theme of all the researchers’ work is improving the way machines interpret and react to human behaviors and cognitive processes. The REU Site in Computational Sensing was launched in 2016 by Alm and Bailey, who serve as principal investigator and co-PI, respectively. It is funded by a nearly $360,000 grant from the National Science Foundation and aims to help a diverse group of American students develop a passion for performing research. The Swedish students received funding to participate from Malmö University and RIT Global. The students are all assigned to cross-disciplinary RIT faculty mentors to help guide their research, and Malmö University faculty are involved in the programmatic activities as well. Malmö University faculty serve as external reviewers for the students’ presentations about their research twice over the course of the summer and provide the students with feedback to help them refine their final presentations at the RIT Undergraduate Research Symposium in August. To learn more about the Research Experience for Undergraduates in Computational Sensing at RIT, go to cs.rit.edu/~reu. Gustaf Bohlin, left, and Kristoffer Linderman, middle, undergraduate students from Malmo, are spending the summer researching computational sensing at RIT with Cecilia Ovesdotter Alm, right, from the College of Liberal Arts, and Reynold Bailey (not pictured), from the Department of Computer Science at RIT.